Duke’s Zion Williamson went and had himself a night on Thursday. The phenom returned to action after missing five games with a knee injury to lead the Blue Devils into the ACC Tournament semifinals with the kind of performance that lived up to the hype surrounding his stature. Williamson helped Duke put away Syracuse 84-72 with a 29 point-performance on 13-for-13 shooting. Oh, and he also added 14 rebounds, five steals, and a block. The game put any concerns about Williamson’s health to bed and reminded everyone in America that they should be terrified of what’s coming in the NCAA Tournament. It was also the kind of performance that left you wondering just what in the world you have to do to stop him. Certainly nothing legal seemed to be working. So when it seemed like Syracuse’s Frank Howard tried to trip Williamson early on in the game, many wondered if a purposeful attempt to re-injure the star was the strategy at hand. For his part, Howard denied the claim afterward, saying that he had no intention of tripping Zion. Others who looked at the footage said that it appeared Howard reached out to hold Zion up afterward, giving the perception that it was accidental. Strong words from Williams that send a powerful message. Tripping and cheating cannot be tolerated. Except…that’s not what Williams said back in 2017 when asked about Duke’s Grayson Allen, who gained a reputation as a habitual tripper during games. Williams said Thursday that “I said this a couple of years ago. I was adamant about it then.” But, thanks to Freezing Cold Takes, who spliced together Williams’ comments from Thursday with his comments in 2017 when asked about Allen, we can see that he talks quite a different story about what is fair game in basketball. 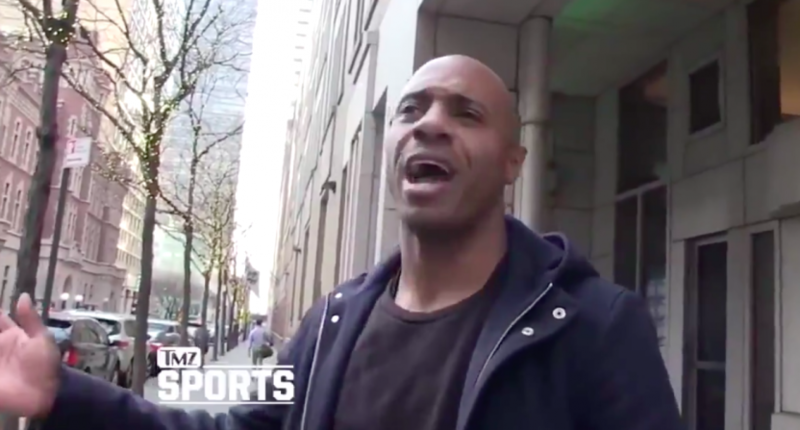 Here’s a clip of @RealJayWilliams from tonight about Frank Howard tripping Zion & @RealJayWilliams in 2017 about Grayson Allen tripping players. So if you’re keeping score, it’s okay for Duke players to trip others and endanger their careers because they need to prove they’re tough guys, but it’s not okay for others to trip Blue Devils because we need to protect Duke players’ financial futures. Maybe Howard did it on purpose, maybe he didn’t. But Jay was right about one thing. It really does seem like “sometimes there’s a tendency to overreact,” especially when you’re picking and choosing who gets to do what they want on the court.